Who's that guy on the right? re: Kevan's comment - my thoughts exactly! john ko has a younger brother? In the book of John, it says, "Don't you know me...even after I have been among you such a long time?" if you look carefully, john is holding a black object. that's an air pump. so while his friend is furiously inflating the mattress through his mouth, john is just sitting there looking bored as the pump is doing all the work. get it?? actually, even after the explanation, i dont really get it either. yes, i saw the air pump. 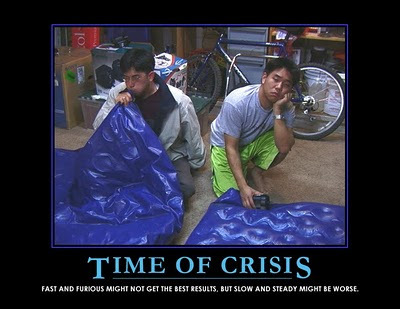 so "fast and furious" is john ko using the air pump, while "slow and steady" is seungsoo, and it's worse b/c john is so bored?